No sooner had the governor and legislative leaders pledged in major public addresses to be prudent with scarce resources than the legislature's Joint Budget Committee voted 4 to 2 to offer state workers a pay hike of 4.5 percent. The JBC, which won't have the last word, voted for a 3 percent straight pay boost plus 1.5 percent in average merit pay — at a cost of $88 million the first year. workers received some increment of merit pay. Those hikes varied according to employees' performance rating and where they stood on the pay scale, but averaged 1.6 percent. 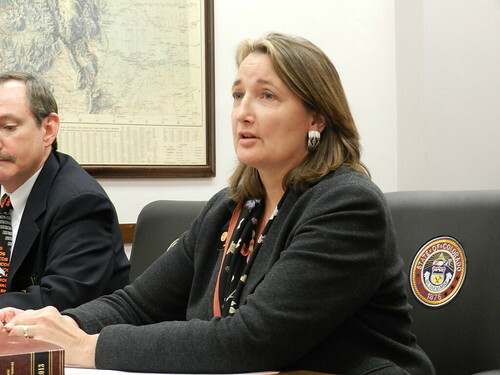 DENVER — Senate Democrats quickly killed a Republican bill that aimed to overturn legislation, approved by Democrats last year, that increased the renewable energy standard for rural electricity providers. The Senate State, Veterans and Military Affairs Committee, known around the Capitol as the “kill committee” — where Democrats send Republican bills to die, voted down Senate Bill 35 on a 3-2 party-line vote Wednesday afternoon. Click here to continue reading on Fox 31. State Senator Ellen Roberts’s (R-Durango) bill to create a state wildfire information and resource center unanimously passed committee. The Colorado Department of Public Safety will be in charge of maintaining the wildfire online resource center and will post information on wildfire prevention, current wildfires in Colorado, up to date information on burn restrictions and other relevant information. The idea for Senate Bill 8 came from the Wildfire Matters Review Committee which met during the interim to come up with solutions for fire preparedness and prevention in Colorado. The bill now goes to the full Senate for consideration. 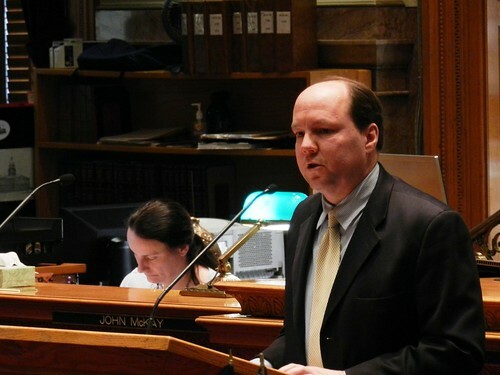 WASHINGTON – A Republican lawmaker from Colorado is pushing to strengthen his state’s media shield law to better protect journalists, citing FoxNews.com reporter Jana Winter’s recent legal battle to keep her sources secret. State Sen. Bernie Herpin said he was inspired by Winter’s case. He wants to change Colorado's law so it more closely matches New York’s version – considered to be the country's strongest in terms of protecting journalists. Click here to continue reading on Fox News. “To be free is not merely to cast off one’s chains, but to live in a way that respects and enhances the freedoms of others,” Nelson Mandela. Good morning President Carroll, Majority Leader Heath, Colleagues, families and guests. Good Morning Secretary Markwell. Please help me welcome my Wife Lisa. I know I promised you an amazing dinner. What I may have failed to mention, is that we are all having that same dinner together. It is our tradition to use opening day remarks to look ahead, to share thoughts, plans and hope for how our efforts in this institution will help shape Colorado’s future. Opening day offers some themes that are bi-partisan, not all but we tend to focus more on collaboration than confrontation. We share our common concerns for the uncommon challenges of governing. Our tradition also includes looking back, reflecting on recent history, and just like we did last year, it’s important to acknowledge and recognize the astounding events that occurred in 2013. A year that brought Colorado horrific loss from fires, again. 2013 also brought flooding of biblical proportion and unfortunately, in 2013, Colorado experienced another year where unbelievable acts of violence took the lives of the innocent. To the families of Nathan Leon, Tom Clements and Claire Davis you will continue to be in our prayers. Having attended two of those memorial services, I know my own life was enriched by the celebration of their lives. All of us who attended those services are grateful their families. Our state has had a couple very tough years, and our people have faced historic challenges. Confronted by these trials, we saw, again and again, neighbors, friends, and strangers becoming true heroes all across Colorado. Predicting and preventing the kind of tragedies we experienced is a noble idea but a nearly impossible quest. Disasters and acts of violence are virtually beyond our control. Emergency preparation and response is not beyond our control, it’s a duty shared by individuals and organizations alike and what we witnessed from Colorado Springs, to Estes Park, From Boulder, to Greeley, from Lyons to the Royal Gorge was a shining example of the heart of Colorado and the spirit of her people. From first responders, to stay-at-home parents, from oil and gas workers to insurance adjusters, from farmers to financial executives, from the National Guard to community churches, from state and federal emergency personnel, to municipal employees. We saw all hands on deck. The diversity of groups that responded at every crises was incredible, organizations included Jewish Colorado, Samaritan’s Purse, Longmont Meals on Wheels, Black Forest Together, The Red Cross, Lutheran Family Services, Boulder Shelter for the Homeless, Catholic Charities of Denver, Weld Food Bank, and the list goes on and on. They all came together for Coloradans in need. Our devastation was no match for our human spirit. We have several folks who served during Colorado’s disasters. They are special guests here representing all who served. I will ask them to stand, as well as all who are here who answered emergency calls across the state. Colorado’s fires and floods certainly made history. They were not the only notable events of 2013. Last year included the loss of a great leader, Nelson Mandela - a man who certainly left his mark on the entire world. 2013 also brought the 100th birthday of the income tax for some reason; we didn’t celebrate that one here in February. That one continues to leave its mark. This chamber lost one of its own, and we celebrated Senator Gordon’s life yesterday. What a fitting tribute to the life of a leader. Speaking of this chamber, of course, 2013 brought historic changes here. So now we have three brand new senators. I had a front row seat while you were each sworn in, but let me take this opportunity in front of our entire body to welcome and congratulate each of you. Senator Herpin, Senator Rivera, and Senator Zenzinger. You can tell whose new here, they are still smiling, because none of their bills have been to state affairs, yet. I would be remiss if I didn’t ask for everyone here to join me in thanking your predecessors, President Morse and Senators Giron and Hudak for their service. Senator Guzman – Thank you for your service, you made history too. Assuming the helm under unpredictable circumstances you exhibited amazing grace. Colorado and most notably this chamber was well served by you. 2013 brought changes to this body. We all know what happened so I’m not going to discuss that. I won’t discuss what happened, I will discuss why it happened. I want to talk about why this happened - and not just the recalls. I want to talk about why the people of Colorado had such a visceral response to what took place in this legislature last session. I want to talk about why. Why we saw historic reactions by Coloradans to what their General Assembly produced during the 1st session of the 69th legislative term. “History made every day” is the slogan of the popular cable network. Why did we make history so much history. - Why did we make history with multiple recall attempts and we now have 3 new senators. - Why Did We Make History with a lawsuit filed against the state by our own law enforcement officials. Why are 55 sheriffs suing over what we did here last year. They even have their own poster!! - Why Did We Make History when nearly a dozen counties actually proposed seceding from their own state. - Why Did We Make History when the people of this state rose up to soundly reject a ballot initiative that was predicated on what we passed last session? We were here just a few months ago. Doesn’t it seem hard to believe that all that really happened since we adjourned. History made everyday in Colorado. The question is why? Anyone, anyone? Bueler? Guns, taxes, rights, those are all part of the “what”. I know you are now all asking “Y”. It’s pretty simple, it’s a math problem. Some of you think, right, you have the numbers, we have a math problem. It’s not the numbers. It’s the formula. This math problem is the formula. Last year this chamber was 20 Democrats, 15 Republicans. Those were the numbers, they are now 18-17. The numbers do change over time. The formula was 20 Democrats versus 15 Republicans. I am not sure if there is a math symbol for versus, but here is one that applies - division. Democrats divided Republicans equaled = history made every day with recalls, lawsuits, secession and initiative rejection. The formula is wrong. Democrats divided by Republicans does not produce outcomes that are representative of this state. In addition to the historic events, that formula produced a hyper-partisan toxin that affected this entire institution, those who serve here and all who visited here, we started looking like congress. When the left side of this chamber is divided by the right side of this chamber, this place does not represent who’s outside this chamber. The left side divided by the right side does not represent whose outside. When President Abraham Lincoln said a house divided cannot stand, he was talking about government. When Jesus said it he was talking about “Kingdoms in heaven and on earth, Government” I think they were on to something. History made every day. Spanish philosopher Jorge Santayana, wisely cautioned those not willing to learn from history are destined to repeat it. Are we willing to learn from history or are we destined to repeat it? Are we willing to agree that the formula here is broken, and are we willing to try a new one? What would the outcomes be if we replaced the division sign with an addition sign? Instead of D’s divided by R’s, what if we try D’s plus R’s. We do have examples of that, but they certainly fade when hyper-partisan politics and narrow special interests control this institution from that lobby. There are 35 of us here. We get elected in Districts. But everything we do, every vote we cast, every dollar we spend affects the entire state - 5.3 million people. And for their sake, we need to keep focused on our shared values and find common goals. Our challenges continue year after year. The challenges to do what’s best for restarting our economy - the unemployment rate is still 50% higher than in 2008. Colorado still has counties that are suffering double digit unemployment. - We Are Challenged to remove barriers to higher Education access for Colorado’s working families, we are challenged especially this year, to rebuild our infrastructure. - We Are Greatly Challenged to do what’s best for our kids and continued K-12 reform is vital. 26% of Colorado students attend a school that is rated D or F. A quarter of our kids head to a school every day that is failing to provide them the education guaranteed to them by our constitution. This is unacceptable and inexcusable. If we don’t fix this, we are failing them. We Are Challenged by These issues they are complex - they are tough. This chamber has only one session to work together to tackle them-one session. Term limits guarantee at least 5 of us won’t be back. (Schwartz, Tochtrop, Harvey, GOV Brophy, Sen. Renfroe) The upcoming campaign year brings uncertainty about who serves here in the future. Our challenge today is to change the formula. Our challenge is to build up relationships that tear down partisanship. It’s up to us, right here, right now - Democrats plus Republicans equals all of us representing all of Colorado. Next year, on Opening Day of 2015, will we look back and say we made history or repeated it? I will spare us all, I won’t go through that list again. If you believe The left side of this chamber plus the right side of this chamber equals what’s best for those who are outside of this chamber, then we can make history every day - we have 119 to go. 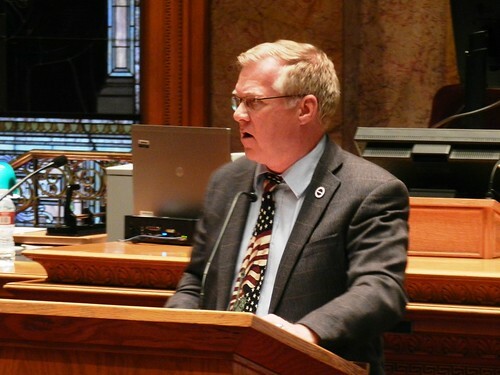 DENVER — Sen. Kent Lambert, R-Colorado Springs, said Colorado has a broken chain of command when it comes to fighting wildfires and he hopes to fix it during the 2014 General Assembly. Lambert represents Senate District 9, which includes Black Forest - an area ravished last summer by the state's most destructive wildfire. The response to that fire has become the center of conflict between the El Paso County sheriff and the Black Forest fire chief. "I'm not trying to pick a fight, but I believe the county has to have the ability to take control when they deem necessary," Lambert said. Click here to read more in the Gazette. The 2014 legislative session is less than two weeks away, and it will be an interesting time in the Colorado Senate. The recalls and resignation of three Democratic senators since we adjourned in May mean a nearly 10 percent turnover in a nonelection year. Election season 2014 looms on the horizon, too, so we’ll have quite the mix of personalities, issues and politics this session. Yet, no matter the upheavals and distractions, we must focus on the threat – no, make that the promise – of continued catastrophic wildfires and the concentrated effort needed to improve forest health, statewide. This may be assisted partly by legislation, but much more needs to be done outside that avenue. Yesterday, Magpul Industries formally announced it would be moving out of Colorado, relocating its manufacturing to Cheyenne, Wyoming, and its headquarters to Texas. The Erie-based magazine manufacturer stated its move was a direct result of the controversial law, passed in 2013, which banned magazines of more than 15 rounds.